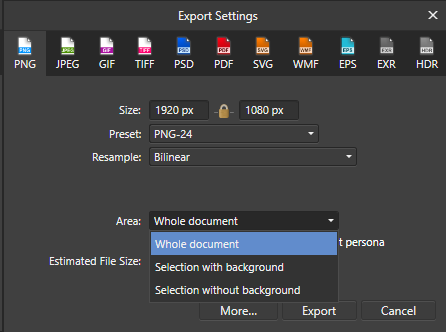 When exporting (Ctrl+Alt+Shift+S) PNG from Affinity Photo , there are options to export the area as 1: whole document, 2:Selection with background 3:Selection without background. I make video game art and export selections of layers frequently as i work on them. So I'm glad i can export a selection of layers as PNG without a background, but i have to manually set the area to "selection without background" each time. Does anyone know if there is a way to change the default area of export PNG from "whole document" to one of the other options? Thanks inf advance! Currently there's no way to make one of the options stick/be default, sorry. Same with Affinity Designer; the option to change default to Selection Without Background would be most useful - even if the programme just remembered what you last used.